The bones may belong to a Columbian mammoth, Mammuthus columbi, a species known to have lived in the San Francisco Bay Area during the Late Pleistocene. Photo by D.J. Arnold, South Dakota Tourism; from Mammoths, produced by The Mammoth Site of Hot Springs, SD. Visit The Mammoth Site at Hot Springs, South Dakota where the skeletons of more than 50 Columbian and woolly mammoths have already been excavated from a 26,000-year-old sinkhole. See images of mounted mammoth skeletons and closeups of teeth on The Paleontology Portal. While there, do an advanced search on Mammut to see how the teeth of mastodons differ. Find out more about mammoths and their relatives in UCMP's 2011 web feature, The Proboscidea. 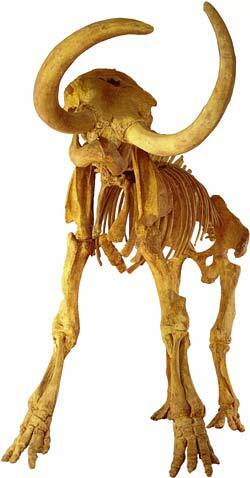 Good information on the woolly mammoth can be found on Philadelphia’s Academy of Natural Sciences site. Want more photos of the mammoth site? Click here! 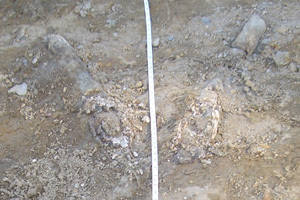 A photograph of the tusks (separated by a measuring tape) sent to UCMP following the discovery. Photo by A. Gurevich, Santa Clara Valley Water District. 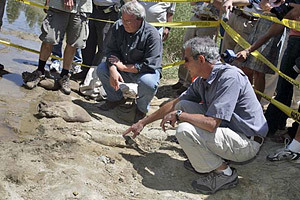 UCMP assistant director Mark Goodwin (right) and amateur paleontologist Steve Marley take a look at the bones Wednesday, surrounded by a crowd of curious locals and reporters. © 2005 San Francisco Chronicle; photo by Lea Suzuki. Used with permission. Once word of the find hit local newspapers, volunteers and security guards hired by the water district rushed to guard the site from vandalism and any unauthorized collecting. UCMP assistant director Mark Goodwin visited the site on Wednesday, July 13, and identified the bones as those of a Columbian mammoth, an elephant relative that lived in the Bay Area during the Pleistocene. Mammoths, members of the Proboscidea, migrated into North America about two million years ago and went extinct about 11,000 years ago. Goodwin tentatively identified the exposed bones as a leg bone, assorted shoulder or pelvic bones, and two tusks. The tusks were identified based on their shape and internal structure; typical bone has a spongy cross-section but tusks have concentric rings of material. The bones appear to be recently exposed and are in relatively good shape, despite their exposure to water and weathering. It is hoped that more of the mammoth will be discovered once excavation begins, either deeper in the sand or washed farther downstream. Security guards will continue to be posted at the site while a crew of graduate students from UCMP assist Goodwin in excavating the bones within the next few weeks. To prevent them from further deterioration, the students will brush them with a “hardener,” a chemical that penetrates and stabilizes the bone. The position of each bone will be mapped before they are wrapped in plaster-soaked strips of burlap. Once the plaster dries, the bones will be sufficiently protected for removal and transport to UCMP, the official state repository for California fossils. Samples of sediment will be collected to help determine the taphonomy (the environment of deposition) of the quarry  to try and determine how these mammoth bones came to be in this location. Bone samples will be carbon-dated to determine the age of the specimen. Bone chemical analysis may also provide some insight into the climate of the Bay Area during the Pleistocene. Once cleaned, the bones may be returned on long term exhibit loan to the Santa Clara Valley Water District or a San Jose museum for public exhibition.